The EMT is the best. If their job was only to stay awake all night, most of us would decline to do it. If their job was only to drive around city traffic at breakneck speeds in a truck, even fewer of us would sign up. But that they do those things and save lives, thinking on the fly to solve the grizzliest problems life can throw at us...well, that’s a hero, plain and simple. What better role model for your kid than these real life heroes who put so much on the line just to save our hides? Well, maybe Batman, but trust us, his origin story doesn’t really pan out in your favor. Alternately, this might be the most terrifying costume we have in store. Think about it: you just flipped your Lamborghini Veneno off of Avenue d’Ostende in Monaco after a night playing high stakes poker (we’re not judging you for this, it happens to us all the time). You’re hurt, you call out for help. You cross your fingers and hope. To your relief someone approaches. You’re saved! But wait -- as the sole figure comes into focus, something seems off about it. It’s too...short. And it hits you. It’s one of those new child EMTs you’ve been hearing about. Can’t be older than eight. They bend over beside you, take something out of their bag, and hand it to you. A SpongeBob Squarepants Band-Aid. You drift off into the darkness. 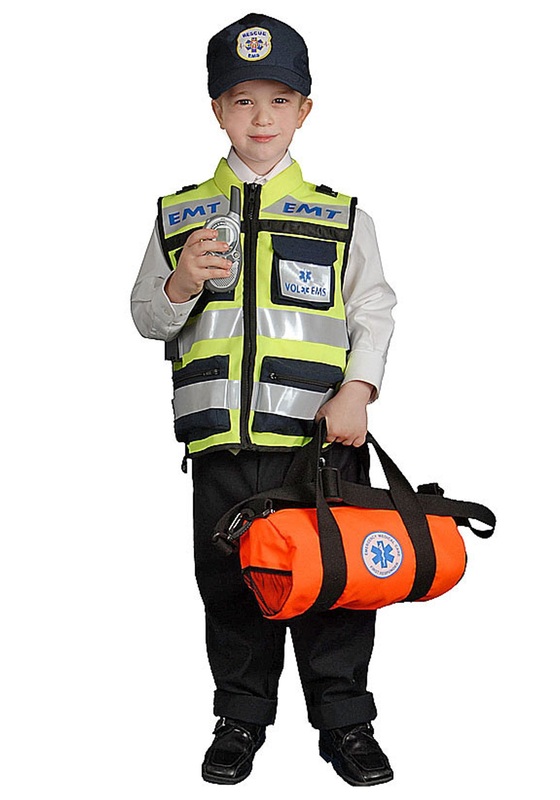 Our Child EMT Vest comes with a cap and duffel bag, everything your child needs to play the part of a real hero. The reflective vest is as authentic-looking as it is safe in the night time, and looks just like the real deal with ample pockets and patches. Your little EMT will love a bag as part of their costume, just the thing to fill with candy. Bandages and syringes can wait!